Grindor's skills indicate that his critical hits on missiles should inflict burn, but they don't. As for Bonescrusher, it is said that his attack his increased when the opponent unleashes a special attack or heavy attack. However, we are not getting anu buff, visual or not, in terms of inscreaseddamages when this happens. And lastly, Optimus MV1 should recover life when inflicting damages, any damages. But when the opponent blocks, he doesn't get any life back even though he still deals damages. 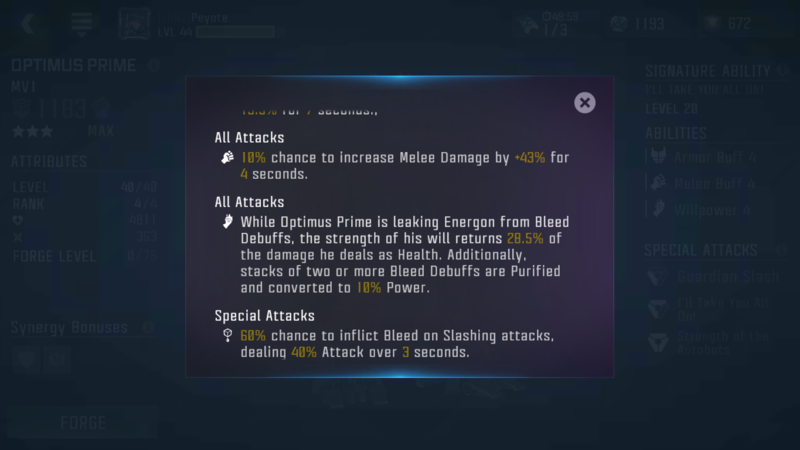 I agree on the last two but i do see Optimus getting his regen buff ,but this bug has to be fixed. Well i have a grinder and he doesn't inflict fire on his opponent that's for sure! It says an increase of attack rating, not a critical buff. And it's both on specials and heavy attacks, but this only triggers on specials. And Optimus indeed get some life back when hitting, but not when hitting and the enemie blocks. But it clearly states when Optimus deals damages, not just when he hits the opponent. MV1 gets health back when he is bleeding. It absolutely works. Please check what I said: he doesn't get health when hitting a blocking opponent! Yes he gets health back the rest of the time but not when the bot is blocking (even though that's dealing damages). It's possible that the health leach from a blocked hit doesn't even offset the bleed. Is this normal hits you're looking at, or are you actually wasting specials on guys that are blocking? Blocking only halve the damages a Bot receive, so the leech should take half of the normal amount, not nothing. He also doesn't regain health on the last hit, the one making the opponents KO. The video doesn't work, but if you're not hitting with specials, you'll probably never see enough leach on a blocked hit to move the health meter up, just more slowly down, so it's going to be harder to measure its success. I can't see what you did in the video though, so maybe you did use a special. No need for a special, when you deal 20 damages or more with a normal hit blocked, that's plenty enough to convert some of it as life considering Optimus converts 30% of damages in life. He just doesn't convert life when he is blocked. They probably meant it this way but nothing is written about it. And the video should be working, not sure what's the problem here. The video works now. I didn't realize that it showed life leached in green. I never looked. Obviously you're right about it. Correct. Life steal doesn't work on blocked hits even though damage is being dealt, and more frustrating is it not working on the KO hit. Yup, these 2 issues had been making me fume especially in raids. But I think they intended to stop everything debug / buff at the point of KO, even how slightly late those were. Evidently can be seen with Ratchet's S2, if you managed to kill ur opponent with the last hit before the heal, the heal does not happen. These are the smallest bugs you gud could of possibly find!!!! Some are not even bugs!!!!!! The only real one here is grinder, but not a single word right? So having different results that the ones expected with skills' descriptions is not a bug for you... But complaining with double posting and orthographic mistakes is clearly fine in your book... Thanks for being so helpful! Here's a video of Grindor inflicting a critical hit on his heavy missiles but deadling no burn debuff. 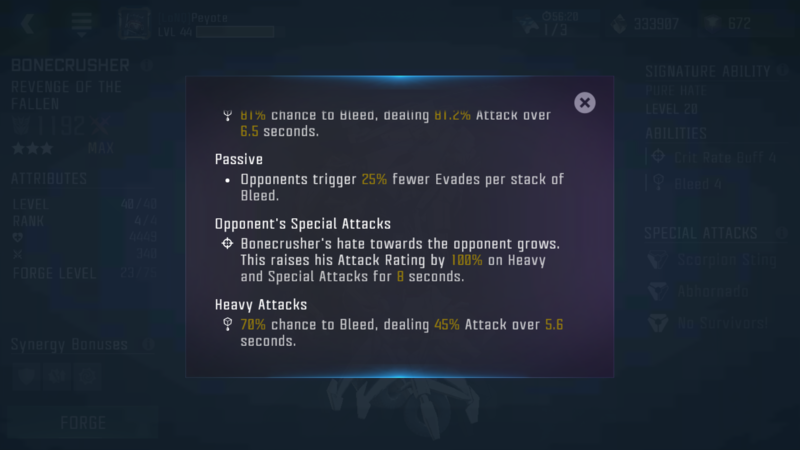 And Bonecrusher not getting an attack bonus on specials and heavies (only a critical buff on specials). Wait ,so your saying it that because i was haveing second thoughts on one of my post. Makes my opinion obsolete!? I aM SoRrY tHaT i CoUlDn'T PleAsE yOu My LoRd!!!!!!!!! !